Throughout his prolific career, Danish painter, sculptor, and author Asger Jorn, 1914-1973, consistently upheld the revolutionary potential of the image. 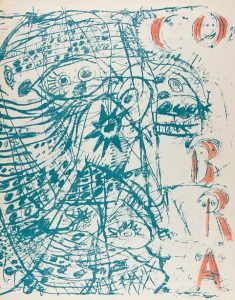 An inveterate collaborator, Jorn was at various points involved with a number of avant-garde groups, including Revolutionary Surrealism, 1947-1948; CoBrA, 1948-1951; and the Situationist International (SI), 1957-1972; and he maintained passionate, intensely productive relationships with individual s across the Continent. The name CoBrA, coined from the initials of the founding members’ cities – Copenhagen, Brussels, and Amsterdam – embodies this spirit of transnational exchange, a commitment equally manifest in the movement’s visual and textual output. 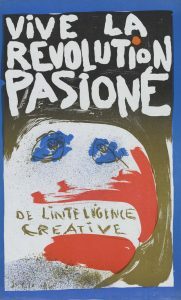 Ranging from clandestine pamphlets to posters on behalf of the May 1968 protesters, the objects in this exhibition urge us to embrace “creative intelligence” – a rallying cry that still resonates today. This opening event also celebrates an exhibition on Q Level of the library entitled “Extreme Materials and Conditions: Common Ground Between Art and Science” by HEMI artist-in-residence Jay Gould. If either of these exhibitions pique your interest, find out more by exploring our Art History Research Guide!